Figure 9.13. Schematic contour drawing of the 70S ribosome in the overlap projection. The 30S subunit is depicted as an empty figure whereas the 50S subunit is shaded. The decoding site with tRNA anticodons (AC, open circle) on the 30S subunit is positioned over the peptidyl transferase center (PTC, closed circle) with tRNA acceptor ends, so that the axis connecting the anticodons with the acceptor ends is approximately perpendicular to the subunit interface. (Redrawn from V. Lim, C. Venclovas, A. Spirin, R. Brimacombe, P. Mitchell & F. M.ller, Nucl. Acids Res., 20, 2627-2637, 1992). Figure 9.14. Mutual orientation of tRNA molecules in A and P sites of the ribosome (stereo view). The phosphate backbones of the tRNA molecules are depicted (A-site tRNA lighter, P-site tRNA darker, with the anticodon regions in white). Two alternative orientations are shown: "P(R)" indicates the position of a P-site tRNA in the R-orientation (A. Rich, in "Ribosomes", M. Nomura, A. Tissieres & P. Lengyel, eds., p.p. 871-884, CSHL Press, 1974), "P(S)" the corresponding position in the S-orientation (M. Sundaralingam, T. Brennan, N. Yathindra & T. Ichikawa, in "Structure and Conformation of Nucleic Acids and Protein-Nucleic Acid Interactions", M. Sundaralingam & S.T. Rao, eds., p.p. 101-115, University Park Press, Baltimore, 1975), relative to a common A-site tRNA. (Reproduced from V. Lim, C. Venclovas, A. Spirin, R. Brimacombe, P. Mitchell & F. M.ller, Nucl. Acids Res., 20, 2627-2637, 1992, with permission). clockwise if wiewed from anticodons along the axis mentioned (right-hand screw). The alternative is the so-called S type orientation (Sundaralingam et al., 1975): the D-loop of the A-site tRNA faces the T-loop of the P-site tRNA (Fig. 9.14, "P(S)"). Here the translocational movement will be counterclockwise (left-hand screw). There are arguments in favor of both possibilities, and the choice between the two alternatives has not been made yet. In the cases where tRNA or its derivative is accepted by the vacant ribosome, one of the two tRNA-binding sites is filled first. This seems to be the same site that is occupied by the peptidyl-tRNA prior to transpeptidation in the translating ribosomes, i.e., the P site (see Fig. 9.1). The retention of tRNA in the P site of the translating ribosome, however, has an important feature. It is vital that the peptidyl-tRNA should not be exchangeable with the medium during translation. Correspondingly, the peptidyl-tRNA bound in the P site of the translating ribosome should not be in equilibrium with exogenous tRNA, but rather occluded, i.e. its dissociation rate should be very low. In contrast, when the deacylated tRNA or aminoacyl-tRNA occupies the P site, the site becomes exchangeable and the tRNA may be released. It is likely that the apparent nonequilibrium retention of the peptidyl-tRNA in the P site of the translating ribosome is due to the contribution of the peptidyl residue (the C-terminal ester bond group) that is anchored by the ribosomal particle during elongation. It is the d site of PTC that may be responsible for the anchorage of the C-terminal ester group of peptidyl-tRNA. terminal aminoacyl residue with its ester and amide groups in the d site of PTC, the rest of the P-site-bound tRNA has been reported to have contacts with domain IV of 23 S RNA, as evidenced by protection of positions 1916, 1918 and 1926 from chemical modifications (Noller et al., 1990). When the P site is filled with tRNA the ribosome becomes capable of binding the second tRNA molecule. This binding takes place at another tRNA-binding site, the A site. Binding in the A site is greatly stimulated by the template polynucleotide; in this case binding is codon-specific, i.e. only tRNA corresponding to the codon placed in the site becomes bound. The affinity of tRNA toward the A site is approximately one order of magnitude lower than toward the P site. In the course of normal translation, the binding of the aminoacyl-tRNA is specifically stimulated by the EF1 (EF-Tu) protein. It may be that the A site, like the P site, is formed by both ribosomal subunits. In any case, the tRNA anticodon should be placed in the immediate vicinity of the mRNA codon, i.e. on the small (30S or 40S) ribosomal subunit, whereas the acceptor end interacts with the a site of PTC, i.e. with the large (50S or 60S) subunit (see Section 9.3 annd Fig. 9.7). Figure 9.15. Two possible positions of the tRNA pair (A- and P-site tRNAs) in the 70S ribosome. The tRNAs occupy the inter-subunit space, with both anticodons in the neck of the 30S subunit, the acceptor ends in the groove ("neck") under the central protuberance of the 50S subunit, and the corners ("elbows") are fixed in the region of the L7/L12 stalk (A.S. Spirin, FEBS Letters 156, 217-221, 1983). The upper depiction shows the R-orientation of the tRNAs, and the lower is the S-orientation (V. Lim, C. Venclovas, A. Spirin, R. Brimacombe, P. Mitchell & F. M.ller, Nucl. Acids Res., 20, 2627-2637, 1992; A.S. Spirin, V.I. Lim & R. Brimacombe, in "The Translational Apparatus: Structure, Function, Regulation, Evolution", K.H. Nierhaus, F. Francesci, A.R. Subramanian, V.A. Erdmann & B. Wittmann-Liebold, eds., p.p. 445-454, Plenum Press, New York, 1993). Figure 9.16. Sites and intermediate positions ("hybrid states") of tRNAs in the ribosome. The ribosome is schematically depicted with the head of the 30S subunit and the central protuberance of the 50S subunit directed to the viewer (thus the L7/L12 stalk being on the left hand). "A" and "P" are the tRNA-binding sites on the 30S subunit, "a" and "d" are the acceptor- and donor-binding sites, respectively, of the peptidyl transferase center of the 50S subunit, and "e" is the site retaining the 3'-terminal adenosine residue of the deacylated tRNA after transpeptidation. A: Positions of tRNAs upon binding of the ternary Aa-tRNA:EF-Tu:GTP complex with the peptidyl-tRNA-occupied ribosome. The tRNA residue of the Aa-tRNA is in the A site on the 30S subunit, but the aminoacylated end is on EF-Tu rather than in PTC (A/T state). The peptidyl-tRNA occupies the P site on the 30S subunit and the d site in PTC of the 50S subunit (P/d state). B:. "Non-hybrid" positions of tRNAs after the release of EF-Tu from the ribosome, prior to transpeptidation. The aminoacyl-tRNA sits in the A site of the 30S subunit, with its aminoacylated end in the a site of the PTC (A/a state). The peptidyl-tRNA resides in the P site of the 30S subunit and the d site of PTC (P/d state). C: "Hybrid" positions of tRNAs after transpeptidation. The newly formed (elongated) peptidyl-tRNA occupies the A site on the 30S subunit, but its 3'-end with the ester group is caught by the d site of PTC (A/d state). The deacylated tRNA sits in the P site of the 30S subunit, but its 3'-terminus with free 3'-hydroxyl is moved to the e site of the 50S subunit (P/e state). D: Positions of tRNAs after translocation. The peptidyl-tRNA occupies the P site on the 30S subunit and the p site of PTC (P/d state). The deacylated tRNA is transiently retained by the e site of the 50S subunit, probably without interactions with the 30S subunit (e state). (D. Moazed & H.F. Noller, Nature 342, 142-148, 1989; H.F. Noller, D. Moazed, S. Stern, T. Powers, P.N. Allen, J.M. Robertson, B. Weiser & K. Triman, in "The Ribosome: Structure, Function, and Evolution", W. Hill, A. Dahlberg, R.A. Garrett, P.B. Moore, D. Schlessinger & J.R. Warner, eds., p.p. 73-92, ASM Press, Washington, DC, 1990). subunit and not bound yet with PTC of the large subunit. This intermediate position has been designated by Noller et al. (1990) as "hybrid A/T site" (the term "A/T position" would be more adequate, however) (Fig. 9.16 A). The subsequent release of EF-Tu allows the acceptor end of the tRNA and its aminoacyl residue to directly interact with the large subunit, more exactly, with the a site of PTC, thus completing the binding of aminoacyl-tRNA to the A site (acquiring "A/a position") (Fig. 9.16 B). Figure 9.17. 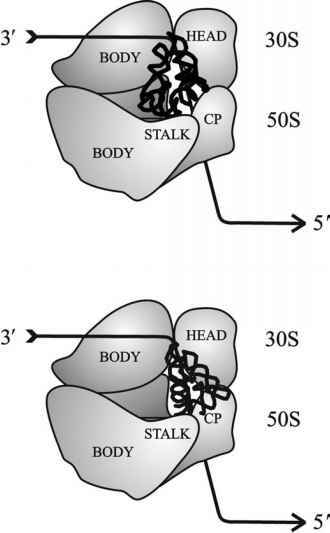 Model of periodical locking-unlocking of the translating ribosome (A.S. Spirin, Doklady Akad. Nauk SSSR 179, 1467-1470, 1968; Cold Spring Harbor Symp. Quant. Biol. 34, 197-207, 1969). The model postulates that the two ribosomal subunits are movably jointed with each other and capable of drawing slightly apart (unlocking) and together (locking). The unlocking opens the functional sites on the subunit interface, such as the A site, and provokes ligand displacements including translocation, whereas the locking closes the ligands inside the ribosome and brings the substrates for transpeptidation together. In other words, the binding of Aa-tRNA requires the unlocked, or open state of the ribosome; it may be that this state is induced by EF1:GTP (the upper depiction). 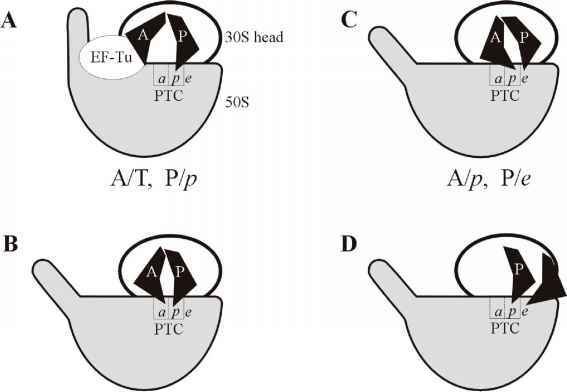 The binding is completed by the release of EF1, and the interaction of the aminoacylated end of the Aa-tRNA with the a site of PTC may cause the locking of the ribosome; the transpeptidation proceeds in the closed ribosome (the middle depiction). The next unlocking can be driven by EF2:GTP resulting in the translocational displacements of tRNAs and mRNA (the lower depiction). Particularly, the unlocking of the pre-translocation ribosome and drawing the subunits apart will create the situation, when the tRNA with the ester group firmly anchored in the p site of PTC on the large subunit drags after itself the mRNA codon with which it interacts and thus displaces the mRNA chain along the small subunit (mRNA translocation). After the release of EF2 the post-translocation ribosome may again close, or rather be in equilibrium between the locked and unlocked states. transpeptidation is still in the P site, its 3'-end is shifted to a new site on the large subunit which can be designated as e (exit) site. Hence, the deacylated tRNA after transpeptidation occupies P/e position (or "hybrid P/E site" according to Noller's terminology) (Fig. 9.16 C). At the same time, after transpeptidation the newly formed C-proximal peptide group together with the added aminoacyl residue and 3'-terminus of the elongated peptidyl-tRNA is found fixed in the d site of peptidyl transferase center. Thus, the peptidyl-tRNA prior to the translocation occupies A/d position (or "hybrid A/P site") (Fig. 9.16 C). As a result of translocation the deacylated tRNA is expelled from the P site (Fig. 9.16 D). However, this does not necessarily mean that it is immediately released from the ribosome: the deacylated tRNA after translocation may be transiently retained on the ribosome in the so-called "exit site" (E site). The e site which binds the 3'-terminus of deacylated tRNA in the viccinity of PTC of the large subunit seems to mainly contribute to the retention of the deacylated tRNA after translocation. It is not clear yet how other parts of the ribosome, especially the small subunit, are involved in the formation of the E site. Transpeptidation in the course of the ribosome working cycle is followed by simultaneous displacements of the three large ligands: mRNA, peptidyl-tRNA, and deacylated tRNA. This may be defined as the mechanical function of the ribosome. Neither isolated ribosomal subunit is capable of even partially performing this function. It is likely that the mechanical function requires the ribosome to be constructed of two subunits. In the search for the molecular mechanisms responsible for vectorial displacements of large ligands, attention should first be paid to a possible large-block mobility within the ribosome. Since the ribosome consists of two subunits, which are relatively loosely associated in the absence of ligands, it is possible, in principle, that the subunits are capable of moving relative to each other during ribosome functioning (Bretscher, 1968; Spirin, 1969). There are experiments demonstrating changes in the compactness of the ribosome in the course of translocation (Spirin et al., 1987) and electron microscopy observations showing the increase of the inter-subunit space in the ribosomes within the cell upon starvation (Oefverstedt et al., 1994); this may be evidence in favor of the relative movement of the subunits by a swinging ("locking-unlocking") mechanism (Fig. 9.17). Another mobile element of the ribosome is the L7/L12 stalk of the 50S ribosomal subunit (Gudkov et al., 1982). A considerable amount of information suggests that the L7/L12 stalk is involved directly in the functions of protein translation factors, and particularly in the EF-G-catalyzed translocation. It would come as no surprise that the mobility of the L7/L12 stalk played a part in the ligand displacements during translocation, as well as, perhaps, in the course of aminoacyl-tRNA delivery into the ribosome. The possibility of some interdomain (interlobe) mobility within ribosomal subunits, especially in the small subunit that seems to be more labile and changeable, cannot be excluded either. The consecutive stages of the codon-directed binding of aminoacyl-tRNA, transpeptidation, and translocation create a cycle, resulting in: (1) the determination of the position of one amino acid residue in the polypeptide chain to be synthesized, (2) the formation of one peptide bond, (3) the deacylation of one molecule of aminoacyl-tRNA, (4) the hydrolysis of two molecules of GTP to GDP and orthophosphate, and (5) the shift (readout) of one nucleotide triplet of the template polynucleotide relative to the ribosome. Repetitions of this cycle create elongation; the number of cycles during elongation depends on the number of template codons (minus the initiation codon). In regard to the material balance, one cycle involves the consumption of one molecule of aminoacyl-tRNA and two molecules of GTP (plus two water molecules) from solution. One molecule of deacylated tRNA, two molecules of GDP, and two molecules of orthophosphate are released into solution (Fig. 9.1). Peptide elongation by one residue takes place concomitantly in the ribosome. From this description the energy balance of the cycle can be summed up. The energy requirements of the cycle appear to be rather modest: they include determination of the position of the amino acid residue in the polypeptide chain (DG0' < +2.5 kcal/mole) and formation of the peptide bond (DG0' @ +0.5 kcal/mole). It is clear that these energy requirements of the complete cycle are amply covered by the free energy which is liberated by deacylation of the aminoacyl-tRNA (DG0' @-7 kcal/mole). Nevertheless, the hydrolysis of two molecules of GTP accompanies the cycle (Fig. 9.1), resulting in the liberation of additional large amounts of free energy (DG0' @-15 kcal/mole). Thus, elongation appears to be a wasteful process, noneconomical and with a low efficiency. 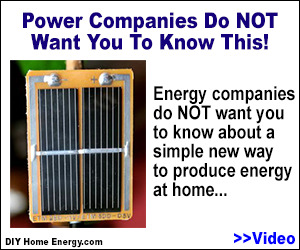 The bulk of the free energy liberated during the cycle dissipates into heat. However, if GTP is excluded even at one stage in the cycle (at the stage of aminoacyl-tRNA binding or at the stage of translocation), the process is greatly slowed and becomes fairly sensitive to unfavorable conditions, drugs, and other impedances. 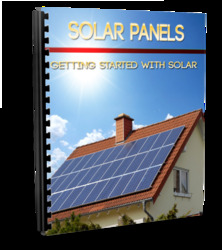 Therefore, a great excess of free energy is needed for the system in order to provide for high rates and high resistance of elongation. It is apparent that economy is not the main advantage providing for the survival of the system and of the corresponding organism in living nature.